The effect that a professional has when painting old wooden chairs (or any piece of furniture for that matter) can be dramatic. In fact, if done properly painting chairs can totally alter your opinion of the furniture piece both in terms of the appearance and your opinion of the quality. I’ll use a set of chairs that we refinished recently as an example of how painting old wooden chairs makes sense. 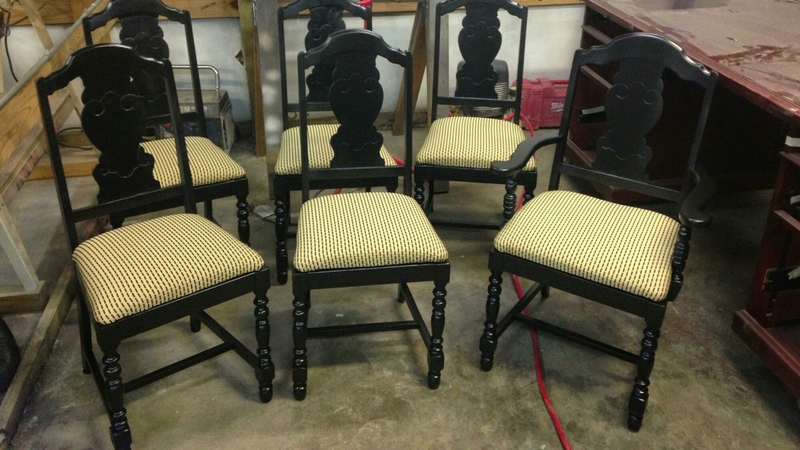 These chairs were purchased at a flee market by a client and brought in for refinishing. Understand that there was nothing inherently valuable about these chairs but they were soundly built and sturdy. 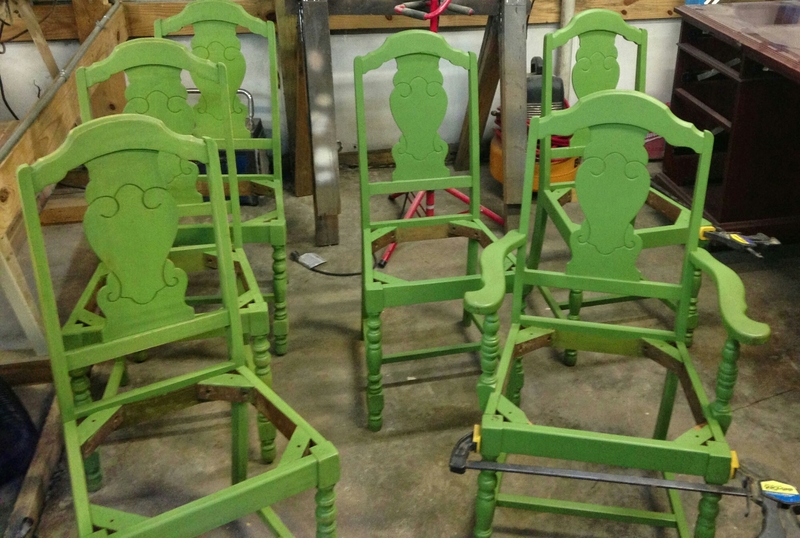 The previous owners used green when painting chairs and made them look horrendous. Not only did the paint look bad but it made the chairs look inferior in quality. This is the before pic…. I suspect you agree with my opinion. As with all furniture we refinish, we take great care in the prep work. These chairs were stripped of all the ugly green mess. We then sanded the wood surfaces to achieve a smooth surface to apply the new finish on. We sprayed a couple coats of primer then sprayed the color. We finished it off with a couple coats of clear lacquer. Again, sanding between coats to ensure the smoothest finish. Lastly we recovered the seats. Notice how the new color and finish totally changes ones opinion of the chairs. They now look like a much higher quality chair. The total investment by the client for our portion of the work was $95 per chair. This fairs well when compared to what the price of new similar quality chairs would be. As they say, don’t judge a book by its cover….